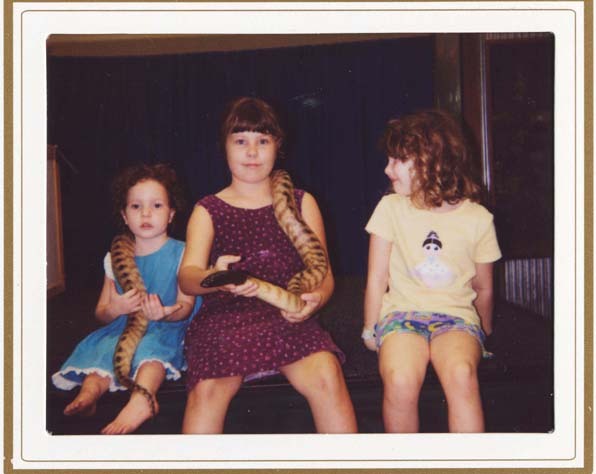 On saturday the girls couldn't resist patting the snake which was on display at the local shopping centre. They had an interesting range of Australian reptiles and mammels. I thought this was a good opportunity to get a good photo of the girls. I now realise that bubs and I should have joined in also so we could have a family shot (though would be minus hubby). Jadeen wouldn't touch the snake or get too close, she was afraid of it but in the end she decided to join them on the platform and sit next to them. Erin was straight in there copying her big sister, Miranda. Jono's Monthly News for April as a PDF file.